I need someone to spazz with me because these two are making me crazy with their skinship and Jaerim's cheesy or disgusting bombs and it's only been their 3rd episode. Song Jaerim and Kim Soeun use skinship to find each other on MBC "We Got Married"
Originally posted by rikayla at Song Jaerim and Kim Soeun use skinship to find each other on MBC "We Got Married"
Still cuts and details of model turned actor Song Jaerim’s and actress Kim Soeun’s first meeting has been revealed today, showing a rather odd first impression of the newly married couple. According to the reports of the newest episode of “We Got Married: Season 4” set to air on the 20th, a new married couple will be appearing before the viewers. Model turned actor Song Jaerim and actress Kim Soeun will be tying the imaginary knot of their marriage for the first time. 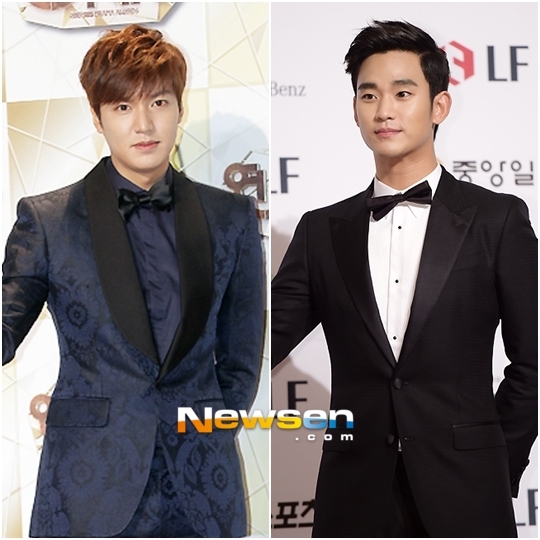 Lee Min Ho revealed that he is willing to work with Kim Soo Hyun in the same project. I found it lately! Its really interesting! There are many different topics and over 70 nice films for relax. It was announced that Kanjani8's Nishikido Ryo will star in a new Fuji TV drama titled "Yorozu Uranai Dokoro Onmyouya e Youkoso" (tentative). The drama is based on the best-selling "Onmyouya" (lit. 'Yin-Yang Shop') novel series by writer Amano Shoko. Nishikido plays a fortuneteller who appears to be a yiny-yang master, but he doesn't possess any psychic powers and never directly tells someone's future. Instead, he makes use of his past experience as a host and is able to to find out the root of his customers' troubles through the art of conversation alone. All the customers are suspicious of him at first because of his frivolous atmosphere. However, his advice actually help them with their various problems and they end up being extremely grateful about having gone to his shop. Fuji TV will show Nishikido as a fake yet warmhearted fortuneteller every Tuesday at 10:00 pm starting in October. Kim Hyun Joong is Coming Back for "Round 3"
Originally posted by contralilium at Kim Hyun Joong is Coming Back for "Round 3"
The actor-singer has released his teaser image for his new album 'Round 3'. His label Key East said, "On the 22nd, Kim Hyun Joong will reveal all the songs on his new album 'Round 3' and go into promotions." It's his first Korean comeback since 'Lucky' one year and 9 months ago. His title song is called "Your Story", the same song that was the title song of his Japanese album 'Unlimited', made into a Korean version into an urban R&B pop. The song's going to have 6 different songs including the title song, so make sure to stay tuned! The K-pop group Boyfriend is set to star in an upcoming Japanese movie called GOGO♂ Ikemen 5, which is based on a popular romantic comedy novel. Boyfriend was formed in 2011 and consists of six members: Donghyun, Jeongmin, Youngmin, Minwoo, Kwangmin, and Hyunseong. Their single “Be My Shine” debuted in Japan on December 8 and immediately reached #4 on the Oricon chart. They also received a sudden spike in attention in Japan when their song “Hitomi no Melody” was chosen as the ending theme of the Detective Conan anime last month. The original novel has been viewed over 600,000 times on the popular user-generated content site Everystar, where it was voted the top romantic novel by users of the site. Due to its success online, a paperback edition was also released last year. It’s especially popular with female readers ages 10-20. The film is a slapstick school comedy and revolves around five good looking young men who are popular, excel at sports, and get the best grades. They’re collectively referred to as “Ikemen 5” and are considered the idols of their school. However, when they all fall in love with the same girl, the group and their school are thrown into turmoil. “GOGO♂ Ikemen 5” is directed by Sakurako Fukuyama (Be Crazy About Me!) and will be released this summer. It has been announced that Kanjani8 members- Yokoyama Yu, Murakami Shingo, and Shibutani Subaru- will be hosting NHK‘s documentary show, entitled: “Ashita wa docchi da!” starting this April. hosting. “Kanjani8 no Ashita wa docchi da!” has been well-received so it will come back as a regular show. The show focuses on ordinary people fighting for “tomorrow” despite the hardships in present-day Japan. The show will follow the same format wherein each host will feature a guest, which they have visited, interviewed, and assisted on site, which will be recorded on VTR. Afterwards, the hosts will share their thoughts in a light studio talk. Synopsis: Takeuchi Shinobu (Tabe Mikako), who has elementary school teaching qualifications, is assigned to be a temporary teacher of Class 6/2 at Ooji Elementary School in Osaka City’s old town. As inquisitive and energetic as her young charges (Maeda Koki, Hamada Tatsuomi, Takahashi Akira, Yagi Yuki, Hamabe Minami, Ninomiya Akari, Maeda Oshiro), Shinobu would poke her nose into strange incidents that happen among people and be up to her neck in it. She loves mystery novels and detests dishonesty. Together with her students, she solves difficult cases that baffle even the police detectives, using her sensitivity and unmatched powers of deduction. Synopsis: Soumato Corporation is intriguing place where recorded images of one’s life can be viewed on DVD. A person who happen sto stray into Soumato Corporation, will be handed DVDs equivalent in number to his age by Kaminuma (Kashii Yu), the company’s mysterious guide. She will tell him to go back and watch his life to his heart’s content. What he will see on these DVDs is his own life through the eyes of other people. He will learn startling facts that are better left unsaid. What will he think after watching everything? Current Music:News - chankapana ! Here are some informations and the buying links on CDJapan. If I did something wrong please tell me ? Description: CD box set release from NEWS featuring four limited editions of the single "Chankapana" (Koyama ver., Kato ver., Masuda ver., and Tegoshi ver.). This edition comes with a bonus DVD, an entry ID "Kin" (valid only in Japan), a folded reversible poster (57 x 5cm). Description: Single release from NEWS featuring a love song. This edition includes a B-side sung by Koyama and comes with an ID (Gin) to listen a message footage (system requirements unknown). *Cover artwork corresponding to each limited editions are different. Features 6-page cover. Description: Single release from NEWS featuring a love song. This edition includes a B-side sung by Kato and comes with an ID (Gin) to listen a message footage (system requirements unknown). *Cover artwork corresponding to each limited editions are different. Features 6-page cover. Description: Single release from NEWS featuring a love song. This edition includes a B-side sung by Masuda and comes with an ID (Gin) to listen a message footage (system requirements unknown). *Cover artwork corresponding to each limited editions are different. Features 6-page cover. Description: Single release from NEWS featuring a love song. This edition includes a B-side sung by Tegoshi and comes with an ID (Gin) to listen a message footage (system requirements unknown). *Cover artwork corresponding to each limited editions are different. Features 6-page cover. Description: Single release from NEWS featuring a love song. Regular edition includes a B-side "Full Swing," which is not included in limited editions. Features 4-page cover. EDIT: Edition N, E, W, S seems already SOLD OUT. Kis-My-Ft2’s Fujigaya Taisuke will be the main character for the new drama “Beginners!”, that will air on TBS every Thursday at 9 pm (golden time) this summer. The heroine will be actress Goriki Ayame. Kis-My-Ft2’s Kitayama Hiromitsu will also be part of the cast. The drama is set in an elite police school with strict rules such as no dating, no mobile phones, no personal conversations between students. Fujigaya’s character is a former biker with a strong sense of justice that aims to become a policeman. Kitayama's comment: "I want to act so that something remains in the hearts of the viewers." another theme song for Kisumai y/y? On May 3rd, it was reported that the entertainment company Johnny’s Jimusho will produce a Chinese idol group. The president of the company, Johnny Kitagawa announced the news and his plans to debut the new group in November at Hey! Say! JUMP’s stage play, ‘JOHNNY’S World‘, at the Empire Theater in Tokyo. Meanwhile, on this day, Hey! Say! JUMP kicked off their Asia tour at the Yokohama Arena. Fans from China, the U.S., and 13 other countries visited to attend the concert. Here are all the mixed photos and all of Kitayama's solo shots that were released on Monday. I only bought two of each of the other members' photos. snowqueenofhoth has all of the group and Nika related photos scanned here. After two years, the boys of Hey!Say!JUMP are back with a new album. The still untitled album will also include songs from their Hey!Say!7 and Hey!Say!BEST releases; moreover, it will also have a single medley and an orchestra version. It has been reported that some members of Hey!Say!JUMP have been doing some composing and music arrangements of some songs as well. The album will be released on June 6th. LOL, I knew it. I'm so gonna love if Yuto's gonna make another Dash!! SNAP is written by Yabu Kota. Originally posted by foreverstorm90 at Another single by Arashi! Arashi's "Face Down" hasn't been released yet, but the 5-member group already have a follow-up with "Your Eyes". It has been reported earlier that Arashi's next single "Your Eyes" will be used for Masaki Aiba's drama, "Miki-Neko Holmes no Suiri". "Your Eyes" will be available in Regular and Limited CD+DVD edition. The DVD will have the PV of "Your Eyes". Moreover, the single is also expected to contain 3 new tracks, which titles are yet to be determined. "Your Eyes" tackles about "good and evil" and "strength and weaknesses" of humans. "Your Eyes" will be released on June 6th. Preview of the song "Your Eyes"
Translated 3 of the songs from Kis-My-1st album. Originally posted by meoinkie2 at Johnny’s group date! On March 9th, Kanjani8’s Nishikido Ryo was seen at a bar in Tokyo attending a group date with KAT-TUN’s Tanaki Koki with pretty 20-something girls. On the 27th of the same month, he was seen at the same bar, in the same set of seats, hosting another group date attended by Arashi’s Matsumoto Jun. The two Johnny’s appeared late at night on Friday, March 9th. Bar “B” is a hidden store that famous people often frequent. The bar closes at 2, and it doesn’t get a lot of traffic so people use it as a place to host secret group dates. There was also another male present, so there were 3 males vs. 4 females at the group date. They ordered many different dishes, from pizza to meat dishes. They were afraid of being found out and so they were pretty quiet at first. The party got rowdier as they drank alcohol, and they were seen having a good time.